The third volume of Saga of the Swamp Thing is the volume where I, for one, have begun to feel more comfortable with the Swamp Thing character. The book is to some extent the most traditional of the Swamp Thing volumes so far -- eight chapters encompassing four or five story arcs, each with well-defined "villains" for Swamp Thing to defeat; plus there's a certain "movie monster" commonality among the horrors (vampires, werewolves, zombies) that ties the book together and adds to the familiarity of the volume. At the same time, each of the stories deal not-so-covertly with political or social issues. As well, there's a running storyline throughout in which Swamp Thing gains and explores some new powers. And Swamp Thing's guide to this enlightenment, introduced in Saga of the Swamp Thing #37 collected here, is none other than John Constantine in his first appearance. This mix of simple and complicated, classic horror and commentary, and one-off stories and overarching threads makes this my favorite of the three Saga of the Swamp Thing books I've read so far. The moment that goes a long way toward my enjoyment of the Swamp Thing character, maybe counter-intuitively, is that writer Alan Moore creates some tension between Swamp Thing and Abby Arcane (mostly centered around Mr. Constantine). Moore backs away from having the couple really fight, which would be ludicrous given they already spend a mostly utopian life hanging out in the swamp, but he does allow for Abby to want them to continue their lives as is while Swamp Thing is tempted by Constantine's siren song. This is a common story trope, especially in science-fiction, when one half of a couple is tempted away from the other by some dark force that holds knowledge of their origins. 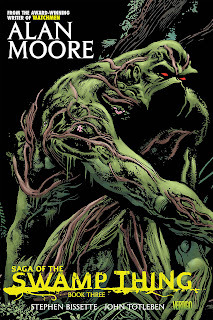 From the first volume -- especially when Moore started in the middle of previous writer Martin Pasko's story -- Swamp Thing has seemed very self-assured, Abby's love for him was immediate, and no one seems to wonder about a seven-foot-tall swamp creature lumbering around. When Constantine starts teasing Swamp Thing's origins, Swamp Thing begins to seem more lost and vulnerable, and this is a Swamp Thing easier for me to understand and relate to than the character so far. The stories within this volume are all very clever (as if you needed me to say so about Alan Moore's Swamp Thing); the presentation of the politics comes off a little dated, but certainly we're still dealing with the environmental dangers in the "Nukeface" and vampire stories, and the racial tensions of "Strange Fruit." My favorite, however, was Moore's werewolf story "The Curse," with the title's double-meaning -- and even its triple-meaning, when the beleaguered housewife's real curse turns out to be the compassion that keeps here from killing her husband. The presentation is again a little dated though the sentiments are not, and in all that single issue (#40) sticks out to be as a good quintessential Swamp Thing story if one had need of such thing some time. In the last volume, Harbinger and the Monitor appeared in a couple of cut-scenes, in DC's run up to Crisis on Infinite Earths the following year. Harbinger is considerably different from her latter depiction as DC worked out the details of the crossover, and only the Monitor's hand appears. I mention it because there's a couple of pages here -- in issue #41, for instance -- where the skies are red, and now I'm not sure if it's just coincidence or more (exceptionally subtle) foreshadowing of the crossover. I'll choose to believe the latter. There's no sense in a reader starting with Saga of the Swamp Thing Vol. 3 instead of venturing back to volume one, but if you're looking for some neat and representative Swamp Thing stories, this volume has them pretty well.